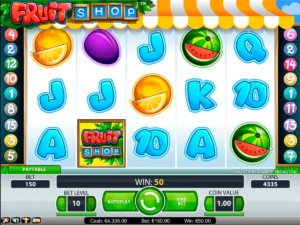 The Fruit Shop slot machine is an exciting game with five reels with three rows and a total of fifteen paylines. The game has been around for some time, but there are still players who have never played on it. However, it is never too late to get acquainted with the fun slots at Oranje Casino, so it is a great time to discover what this game has to offer. This casino game can also be played in the mobile casino and is also available in the online casino. There are several settings that are set by default, but the player can set them to a different level. The reels on the Fruit Shop slot machine are filled with fruit symbols and range from oranges to cherries and from melons to lemons. In addition to the fruit symbols, however, other symbols can also be seen and consist of the letters A, J, K and Q and the number 10. In addition, there is a game symbol present in the game that can be recognized by the Fruit Shop logo. That symbol occupies a special place, because all other symbols can be replaced with it. In addition, a wild symbol pays twice the bet on an active payline for a winning combination. The free spins that can be won are the most important game feature of this slot machine. Free spins can be won in several ways. If two cherry symbols appear on a payline, that already gives the right to a free spin and three of these symbols also spin a free round. The number increases to 2 free spins with four cherries and to 5 free spins with five cherries. A different number of free spins applies to the other symbols, such as melon, orange, grape and lemon, because only then will a free spin be given with three identical symbols. During the free spins round, it may be possible that another winning combination with an extra symbol falls, which means that you can again be entitled to a free spin. Due to these many options to win free game rounds, it is quite common for the reels to spin without betting off the balance. A total of ten bet levels are available at the Fruit Shop slot machine and the coin value applies. that you can bet from 0.01 euro up to and including 1 euro. Depending on the bet level it means that you can play with more or less money per bet. A bet of 0.01 euros at stake level one costs 0.15 euros per spin. With a coin value of 1 euro and bet level one, 15 euros per spin goes off the balance. The highest bet is 150 euros with a coin value of 1 euro and playing at bet level ten. One of the special settings that can also be set is that the game will stop for a while if you win with free spins.